Each year some £70m of damage is caused by fires and theft on construction sites or in buildings undergoing renovation. Stewart was the editor of the joint insurance/building industry code of practice which was first published in 1993 to deal with losses in this area and is now (January 2018) in its ninth edition. The use of new building methods including laminated sandwich insulating panels and timber framed structures has further exacerbated the risks of and from fire and there are signs that insurers are seriously concerned about the loss protection for such buildings especially when higher than three storeys. The Consultancy has extensive experience of reviewing fire precautions and security on construction sites and has also undertaken work on behalf of clients who have been concerned to ensure that these threats to their building or project is managed correctly. 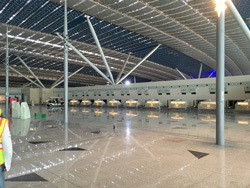 We are proud to have been involved with such major projects as: the new King Abdulaziz Airport, Jeddah, the Kingdom Tower, Burj Khalifa, the Shard and Heathrow Terminal 2. We have recently been appointed to review fire safety for the Riyadh Metro system. The Consultancy is currently undertaking a number of long term assignments to provide underwriting support for major projects in the Middle East and Central Asia.